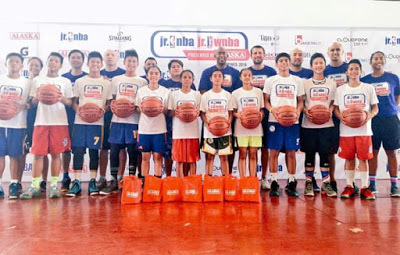 The Jr.NBA and Jr.WNBA Presented by Alaska continues its search for the best basketball players in the country when it holds its second Regional Selection Camp at Don Bosco Technical School in Cebu City on March 5 and 6. Boys and girls may join the search for the ten best boy and five best girl basketball players who will become members of the Jr.NBA and Jr.WNBA All-Star team. There is also a search for the boys and girls coaches who will handle the two teams. All-Stars traveled to China to watch the NBA Global Games in Shenzhen featuring the Charlotte Hornets and the L.A. Clippers. The Jr. NBA and Jr. WNBA Presented by Alaska is free and open to boys and girls ages 10 to 14 years old (born 2002 to 2006). Interested parties may register at the venue in Ateneo de Davao University or online through www.jrnba.asia/philippines. The Jr. NBA and Jr. WNBA Presented by Alaska is one of Alaska Milk’s programs that shape, train, challenge and inspire children to achieve their dreams and aspirations in life. “These holistic programs train children to be confident, disciplined and hardworking because Alaska Milk Corporation aims to prepare them to be winners in life in the future. This year’s program includes new locations such as Batangas, Catanduanes and Cavite to reach more children and coaches and discover the best basketball players across the country,” said Blen Fernando, Marketing Director. This year’s program started with the tip-off at Don Bosco Technical Institute Makati last Jan. 23. School clinics, that teach the fundamentals of basketball, will run until April with stops in Bukidnon, Butuan, Cagayan de Oro, Dagupan, Davao, Iloilo, Metro Manila and Puerto Princesa. New locations include Batangas, Catanduanes and Cavite. Other than Cebu there will also be Regional Selection Camps in Manila on (April 9-10). The top 50 boys and 24 girls from the Regional Selection Camps will advance to the final selection stage in the National Training Camp in Manila on April 22-24.